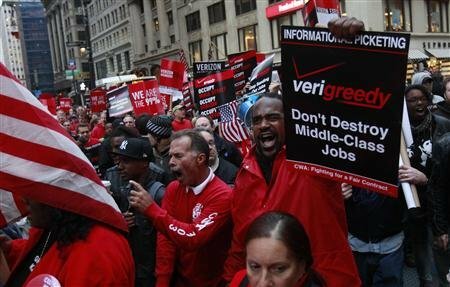 Anti-Wall Street protesters joined Verizon Communications workers on Friday in a march to denounce corporate greed as the company and 45,000 employees negotiate a new labor contract. The march by about 500 people to a Verizon store in Lower Manhattan coincided with the top U.S. mobile provider reporting a third-quarter profit of $1.38 billion, more than double its profit for the same quarter last year. Support from unions across the United States has helped boost the ranks of the Occupy Wall Street movement against economic inequality, which began five weeks ago and sparked protests nationwide and globally. Among those handcuffed were Princeton professor Cornel West and Reverend Stephen Phelps of Riverside Church. Some “Occupy Wall Street” protesters also took part. Organizers say stop-and-frisk is illegal and singles out minorities. “It is a racist practice, and it really needs to stop. People need to stand up,” said one protester. Hundreds of student activists from dozens of colleges and universities across the US are expanding the grassroots movements for Palestine solidarity activism despite aggressive smear campaigns by pro-Israel groups. . . . And at night, organizers headed down to the Occupy Wall Street encampment in New York’s financial district to address a general assembly. On October 22nd, HISTORY in the Bronx continues to be made. “Occupy The Bronx” will hold a peaceful demonstration, representing the 99% of humanity. There are numerous causes being fought for, all spearheaded by a single principle…THE PEOPLE’s VOICE MUST BE HEARD. October 22nd, we will gather again at Fordham Plaza. ‎In solidarity with the people of Palestine, we are asking that on Oct. 28th everyone come to Liberty Plaza wearing their Kuffeya. EIR will be on site silk screening shirts for a $2 donation. Sat., 10.21: Chicago: The Occupation Will Continue! Tomorrow Occupy Chicago will make a stand! Reach out to your friends, family, colleagues, organizations that you belong to, universities, representatives, and all others, and tell them to come be a part of history. As immigrants wage the uphill battle to reclaim the most basic of human rights, they too are among the 99 percent. This is an opportunity to take things forward. In New York, the Occupy movement got a shot in the arm from similar police action. Mass arrests and assaults galvanised broader layers of the public, who had shown sympathy and passive support for the protests, into action to defend the encampment. The workers’ movement got right behind it and it took off. With a bit of luck, and a lot of outreach work, we might be able to get more people involved in the coming days here as well. Now that the protests have spread around the world and appear to be morphing into a movements against many things including ruthless capitalism, corruption, inequality and the arrogance of power, China’s rulers have apparently decided that this is getting too close to home. Hundreds marched on Thursday night from the High Court, in Ramses, through downtown Cairo streets, ending in Maspero, where the State TV is located, denouncing the sectarian massacre perpetrated by the Egyptian army against (mostly) Coptic protesters on 9 October, 2011. Hundreds of thousands protesters. The biggest strike and workers demonstration since the fall of junta (1974). Left-wing political parties, trade unions, social activists and student groups at a press conference in the Labour Party office invited people to join them in an Occupy Lahore anti-capitalist camp at 1 pm, Nasir Bagh, on October 22. In 2010, on average 250 children were in detention each month, and in 2009 the monthly average reached 300. The police demonstrate the side they take with every truncheon blow against protesters from New York to Athens. But it’s this year’s drama in Tahrir Square (acknowledged with an Egyptian flag at the London camp) that has given it such evocative power. And while the 1990s anti-capitalist globalisation protests took place at a time of boom and speculative frenzy, today’s occupations are targeting a global capitalism in the deepest crisis. Socialist ideas have had an enormous influence in the Middle East, and can return to the fore once again.